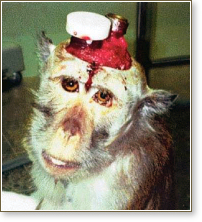 A primate experiment conducted at the Hebrew University laboratories in Jerusalem, which was documented undercover, exposes some horrific pictures: in the course of the experiment, electrodes are inserted into a monkey's brain while he is fully conscious. This documentation with a hidden camera is considered to be one of the only full documentations of similar experiments around the world. 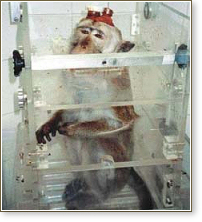 It is estimated that around 150 non-human primates are being held in Israeli laboratories. 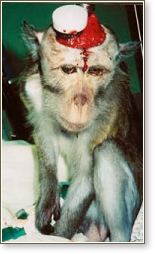 one of many victims of primate research in Israel.